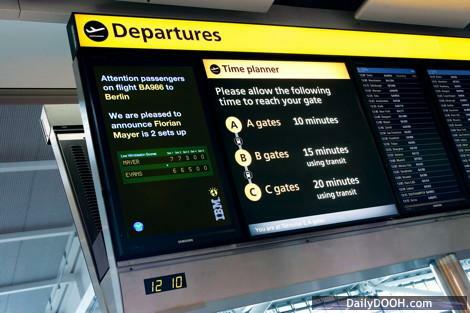 IBM are being poorly served by the return of last year’s live feeds campaign at Heathrow Terminal Five aimed at keeping passengers up to date with the latest Wimbledon championship information via the airport’s digital panels. The airport screens, as they did in 2010, bring together two separate live feeds – departure information from BAA and Wimbledon progress updates from IBM – into one creative execution. The information shown is then linked to the upcoming flight schedule and refers to players from countries relevant to travellers in the airport at that particular time. All very clever but they are missing one thing and that’s colour. As The Imperative Group’s Chris Heap pointed out here last year “Great idea; dynamic, targeted and live – all the facets that make Digital so compelling. So why did I have to read the screen to understand what it was trying to tell me? Where was the look and feel that instantly defines Wimbledon (e.g. Scoreboard/Green/Racket/Strawberrys) – iconic graphics that provides a visual context and a reason to view”. This is a clever campaign but the copy blends too much into the other screens adn overall it could have been so much better. The campaign was booked with JCDecaux Airport through Kinetic and Mindshare and will run across eighty-two digital screens located in the departure lounges and along the main walkways, reaching passengers throughout their airport journey. This entry was posted on Sunday, June 26th, 2011 at 18:41 @820 and is filed under Scuttlebut. You can follow any responses to this entry through the RSS 2.0 feed. You can leave a response, or trackback from your own site.